Anyone who engages in occasional (or frequent) alcohol consumption generally has a beverage of Imagechoice that is their go-to at home, or at other social events. Generally, deviation from the norm only occurs at restaurants and bars where fancy drink combinations are all too tempting not to swtich things up a little bit. But, drinking out of the house gets expensive, requires transportation planning, and pajamas aren't generally an acceptable wardrobe option. So, for those that want to live on the edge with their drink choices, without ever having to leave the house, there is Julibox. Julibox is a cocktail delivery service, and each and every month, they send along two drink recipes and all of the alcoholic ingredients required to make them. The type of cocktail remains a surprise when you subscribe to the service, and that's part of its appeal. If you receive ingredients and aren't too sure you're going to enjoy Julibox's selection, they do have other recipes on their website to choose from. 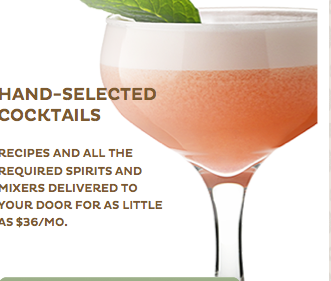 The cost of the Julibox cocktail delivery service is $36.